Our Calgary and Edmonton shops are excited to announce the winners of their $100 Canada Prize Pack contests which ran during the Winter Olympics. Several people correctly guessed that Canada would bring home 25 Olympic medals. We held a random draw among the correct entries, and Carol-Anne T. of Calgary and Veronica C. of Edmonton won. 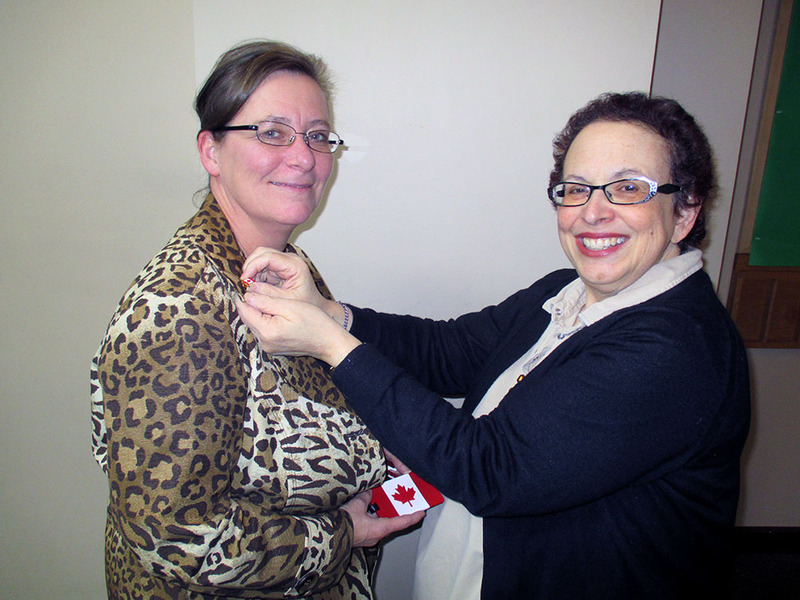 Veronica told The Flag Shop Edmonton that she is planning to fly the windsock & flag at her lake this summer. We love to hear that! We hope you both enjoy your prizes! Thank you so much to everyone who entered our contest! Stay tuned for more fun Facebook contests in the future. Pictured below is The Flag Shop owner, Phyllis Bright, personally delivering Veronica’s prize. Betty at The Flag Shop London discusses the run on Canadian flags for Canada Day in London’s Free Press. Phyllis at The Flag Shop Edmonton was contacted for a story about a 1967 Canadian Centennial flag found in a basement and brought out for Canada Day this year. Here is a story from Phyllis, the owner of the Edmonton Flag Shop regarding some work they did for the Alberta military as they prepared for the Nijmegen March in the Netherlands last year. 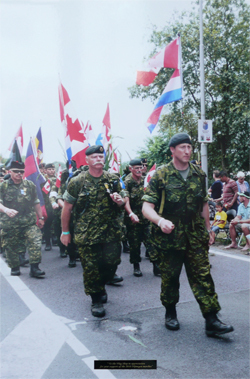 The annual Nijmegen Marches are a rigorous and prestigious endurance event in which Canada has participated since 1952. During the Marches the participants complete a four-day march of 40 km per day while in combat uniform and carrying a minimum rucksack load of 10-kg. The event draws over 40,000 marchers from 50 different nations every year and has over 1 million spectators along its 160-km route. The Marches begin on July 19th this year, and 2011 marks the 95th time the Marches have taken place since 1909. Learn more about our Edmonton store.